Spring and summer is the time for picnics and pasta salad - but what do you do if you're raw / gluten free / vegan/ diabetic / low-carb and don't eat pasta? 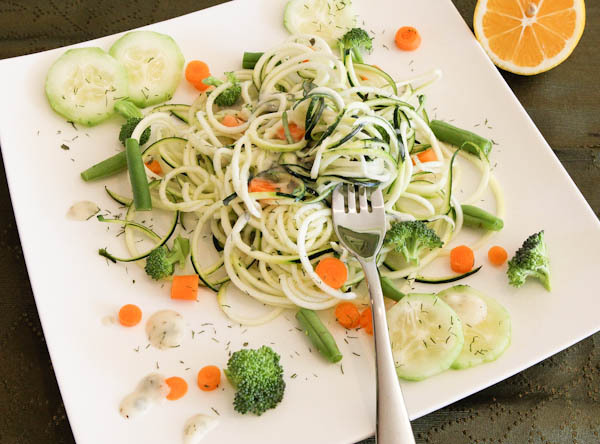 Spiralize zucchini, of course! Basically no-carb and 100% diabetic-friendly, this recipe from Averie Cooks is all from scratch and ready in minutes! Who says you need processed pasta to have a fabulous, hearty meal? This fantastic recipe is quick, easy and delicious - not to mention super healthy and packed with fresh veggies! Optional: 1/2 cup edamame, diced tofu, garbanzo/white/navy/cannelloni beans, quinoa, etc. for protein.